“Hi, we saw the show on Saturday, It really was an amazing display of talent & coordination. Between the "surround sound " Sound effects and the magnificently timed lighting the characters were brought to life , so very up close and with really great proficiency. I left smiling...GOOD JOB GANG !! “Ed...Thank-you for writing your play. I was able to identify with your characters because I am a survivor. For me it drove home the fact that brain injury is still unknown territory. If you play was a video, I would watch it constantly. Now that you have presented the plights of the brain injured in present day time, I wonder what the future hold for them. As for me, I take each day as a it comes and do all that I can . I wish you the best in all your productions. Keep going forward and pushing the limits. 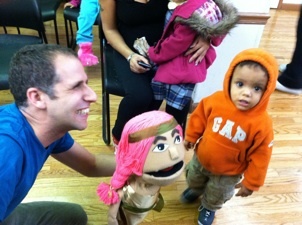 Since 2008, our outreach program (Theatre for Communities) has toured our work to social service organizations and other historically underserved Brooklyn communities free of charge. By bringing work directly to communities (performing at our partner organization sites), and offering tickets to underserved audiences, we’re creating a continuing opportunity for arts exposure. Writer/performer Dan Kitrosser gets audiences involved during performances.